A new program will model new roles for graduates of the University of Tasmania's Bachelor of Dementia Care to support the development of dementia care practice in residential aged care homes. The $250,000 Improving Dementia Care Program is an exciting collaboration between the University’s Wicking Dementia Research and Education Centre, Masonic Care Tasmania and the Masonic Centenary Medical Research Foundation. Running over two years across three masonic Care Tasmania aged care sites, including two dementia specific units, it will explore how Bachelor of Dementia Care graduate Kim Page can shape a new model of dementia care in aged care practice. 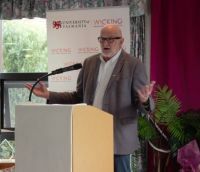 Co-Director of the Wicking Centre Professor Andrew Robinson said the project would be an important step forward, capitalising on the opportunities created by the still quite new Bachelor of Dementia Care. “By drawing on the skills Kim gained from the degree, she will be able to implement evidence-based practice in clinical improvements, managing behaviours and utilising the skills she has developed through her study,” Professor Robinson said. Photo Caption 1 – Kim Paige, Dr Emma Lea and Dr Kathleen Doherty. Photo Caption 2 – Professor Andrew Robinson.